The sequence for creating new courses at Carmel High was changed this school year with the site leadership committee, a group of department heads, placed in an official position of influence and recommending course offerings of Advanced Automotives II, AP Studio Art 3D and Video Production III for the 2019-2020 school year. Yet staff members report that changes made weren’t communicated clearly and members of the site leadership committee were confused about their exact role in the proceedings. In the past, the site leadership committee served as unofficial advisers to CHS Principal Rick Lopez and managed the district’s decision on new course proposals. With the newly instated process, however, the committee now fills a much more active position in the process including recommending or denying a course proposal for advancement to the district level. This changing process and communication concerns regarding the exact details and goals of the leadership committee involvement created varied opinions regarding the process. The main point of confusion revolved around what specific issues the leadership committee was supposed to evaluate. Lopez recognized this problem and expresses his desire to clearly define the site leadership’s role as solely concept approval in the future, reporting that he has since discussed these issues with the site leadership committee and that they will come to a better solution together. The principal specifies that, moving forward, business decisions will most likely be the sole responsibility of administration and the district, not the site leadership committee. 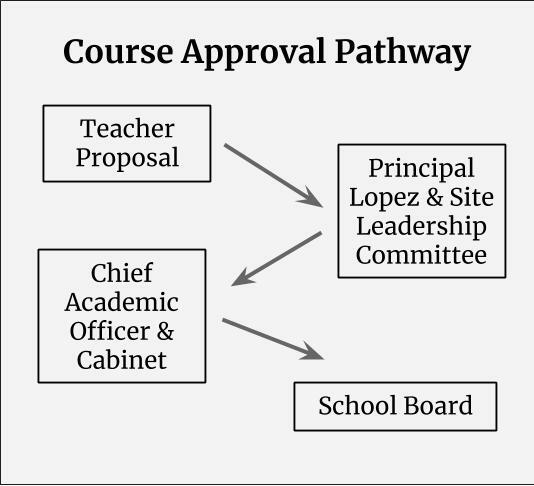 Course approval by Lopez and the leadership committee also had a Sept. 20 deadline as part of the more streamlined process. In order for a course to be implemented in the next school year, it needs to be approved almost a full year in advance to give the proposal time to travel all the way through the chain. That process needs to conclude before January in order for students to select it from the course catalogue for the following school year. To be approved, a proposal must pass through the site leadership committee and Lopez at the local level, before being evaluated by Carmel Unified’s chief academic officer Suzie DePrez to be discussed in a cabinet of district-level administrators. Finally, the course is brought to the school board for approval. The newly delineated process isn’t a closed loop and rejected ideas can be submitted again. Two courses recommended this year, Auto II and Video Production III, are being implemented to help students complete various Career Technical Education pathways. Completing a particular CTE pathway requires two classes and 300 hours of in-class instruction, for which students receive college credit and CHS receives additional funding from the state. Also forwarded by site administration is AP Studio Art 3D, proposed by art teacher Steven Russell to complete a trinity of AP art classes, joining pre-existing AP Drawing and Studio Art 2D. Russell needed to go through the additional step of submitting curriculum and syllabi to the College Board for approval. These course proposals aren’t official yet, however, and are still working their way through district-level approvals.